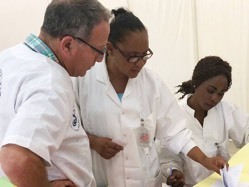 An Israeli team is in Zambia to help fight the cholera epidemic in the country. Presidential Spokesperson Amos Chanda stated Sunday during the daily cholera emergency response meeting and briefing that the Israeli specialists will focus on the deployment of high technology to deal with water purification and treatment, with the overall objective of dealing with cholera in a comprehensive manner. The five-member Israeli team is comprised of water engineers and epidemiologists. The team has begun to conduct tests and gather information about the epidemic. The Israeli technical advice "will also include interventions for medium- and long-term to address sanitation problems especially in high density population areas, focusing on the areas where the epidemic is most serious," Chanda said, according to a report by the local Lusaka Times. Chanda clarified that the operation was not a government-to-government mission, but an initiative of the Sheba Medical Center in Tel Aviv and the Zambia Border Company. The cholera outbreak has killed at least 58 people across the country since September. The outbreak was initially linked to contaminated water from shallow wells, but investigations indicated that contaminated food was the main cause, Reuters reported. The military has intervened in an attempt to quell the spread of the disease, and highly contaminated areas have been subjected to a curfew. Israel has a long history of sharing its expertise with African countries. Israel is world-famous for its advanced water technologies, which can provide solutions to even the driest and most barren areas on earth. With many years of experience in making its southern desert, the Negev, bloom, Israel has become a leading force in providing aqua know-how to countries around the planet.